Jane and I were by ourselves for the dark sky weekend of November 14, 2009. We set up at our usual spot at Chuckwalla Bench. Unlike the past two months, this night featured a cold air mass that required bundling up well. It also implied that the seeing from our desert location might not be perfect. 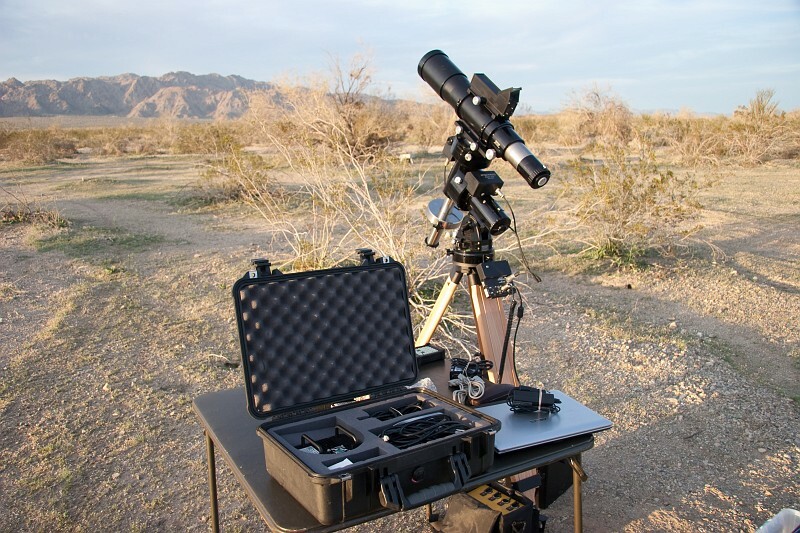 Jane brought her 12.5-inch Litebox dobsonian, and I opted for the 4-inch Traveler refractor (seen in my heading photo). The night turned out to be beautiful. The seeing was good, and we were able to enjoy a few early Leonid and Taurid meteors as well. My goal was to try getting more exposure minutes on some classic targets, and try to get some piggyback constellation photos as well. The famous Pinwheel Galaxy, M33, was a difficult object for me when I started out in astronomy with a classic 8-inch Celestron SCT. The face-on spiral is enormous in the sky, covering almost as much area as the nearby Great Andromeda Galaxy. But its surface brightness is low, so with a little magnification it’s possible to look right through the galaxy without seeing it. I later learned that it sometimes shows up better in binoculars than a telescope. 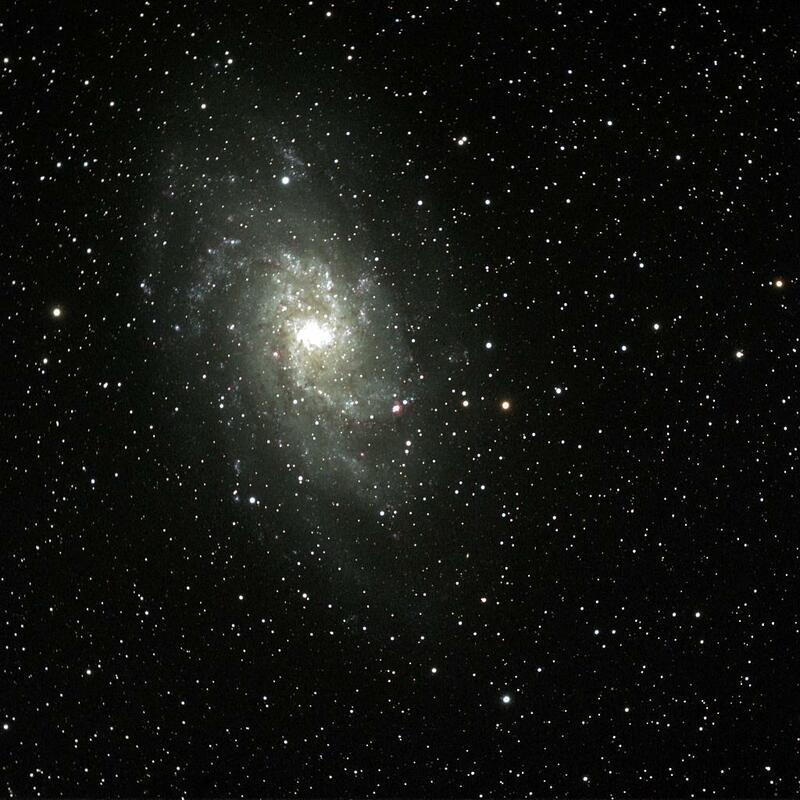 If you click on the naked-eye resolution photo nearby, you can find M33 as a faint smudge just to the left of center. M31 the Andromeda Galaxy bright core is in the upper left. 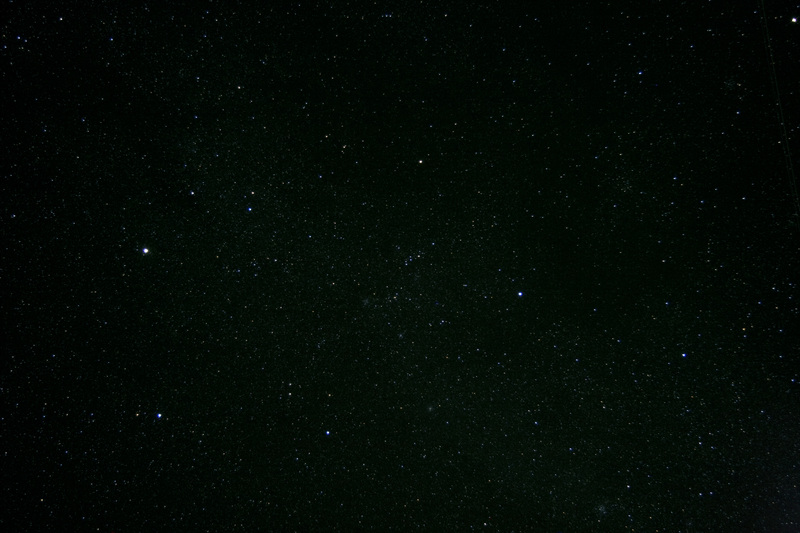 The three bright stars of Triangulum are in the lower third, just left of center. 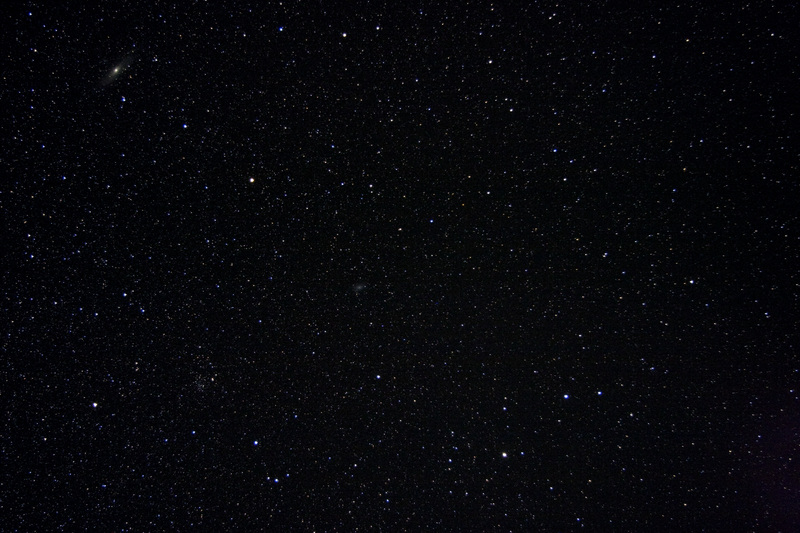 The bright stars of Aries are also in the lower third, to the right of center. (Might be fun to use Flickr’s photo tagging feature to highlight the features. Again “click to embiggen” as Phil Plait would say. This image is a stack of four 15-minute exposures with the AP Traveler and the SBIG ST-4000XCM one-shot color CCD camera. I love seeing the famous red star-birth regions sprinkled through the arms of this nearby galaxy. In terms of technique, I used a Bahtinov focusing mask for the first time. It saved a lot of time in finding and maintaining focus. Autoguiding worked perfectly. It felt really good to have confidence to take long sub-exposures and stack them in Photoshop. This was my first true one-hour image, and the first I’m proud to have seen at full resolution. Auriga was one of the first constellations I identified and recognized on my own as a new astronomer, so I’m always delighted to see it again. 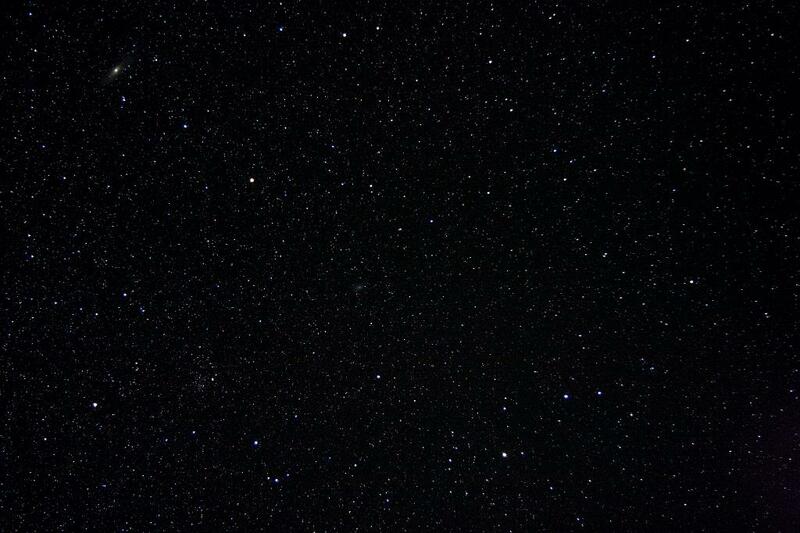 In the piggyback shot, the bright Auriga stars form a squashed pentagon slightly left of center. The right-most star doubles as part of Taurus. 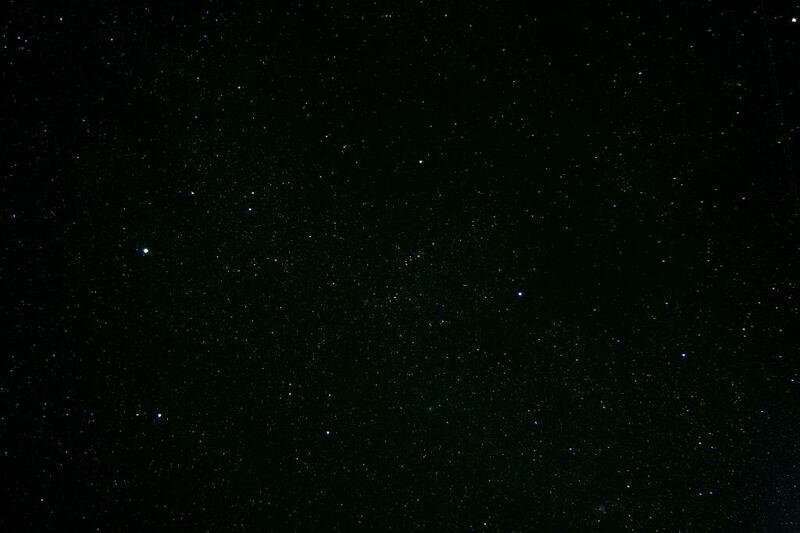 North is to the left, and the brightest star there is Capella. In the full-resolution image you can see the Milky Way open clusters M36, M37, M38, and I think that’s M35 in Gemini in the lower right. Jane was enjoying touring through targets in this part of the sky, and spent some time attempting to see visually the difficult target IC 405, the Flaming Star Nebula. (Her companion post on the subject is coming soon.) 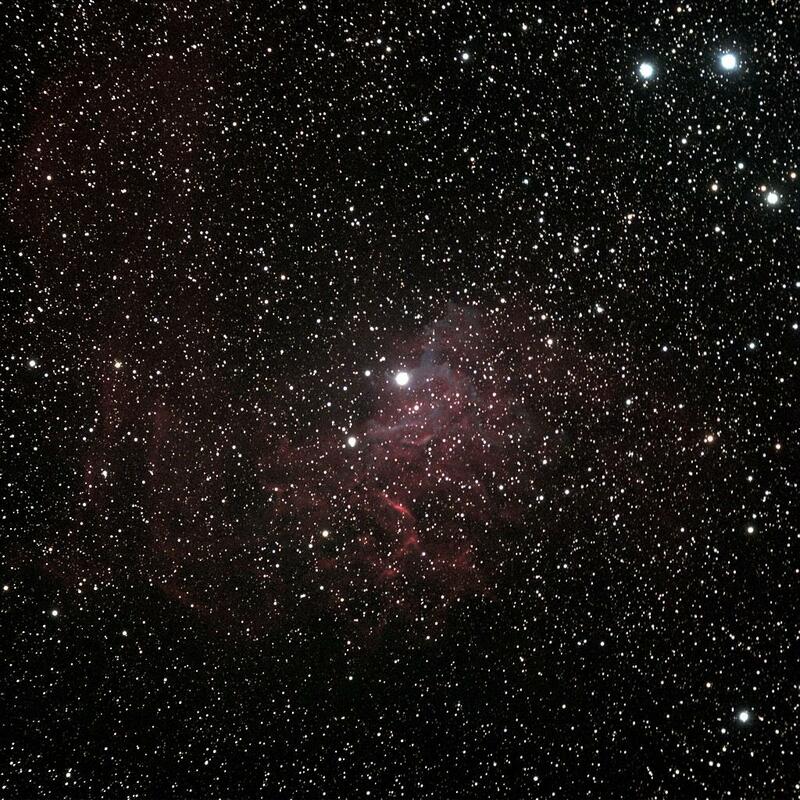 I was intrigued as well, and took 30-minutes of exposure time on IC 405. 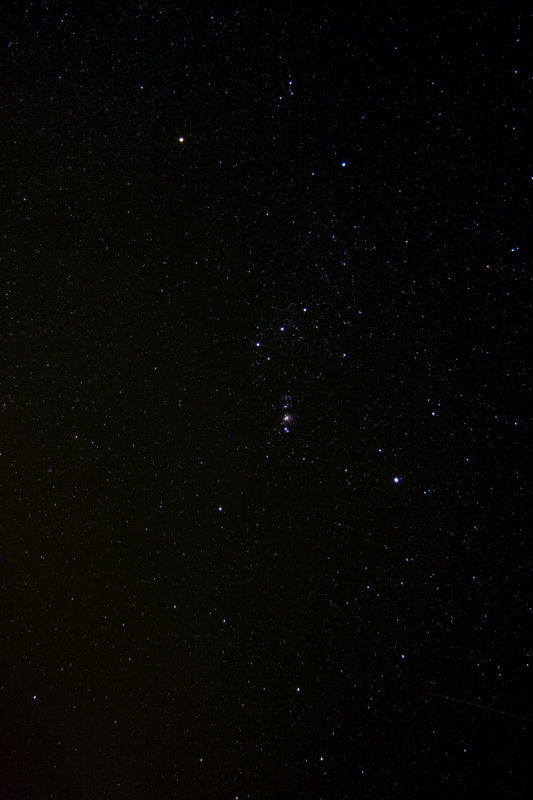 It’s not visible in the piggyback view, but is found in Auriga near the upper center of the picture. I wasn’t familiar with this target, and the 30-minutes of data here shows only the brightest areas of this faint nebula. Longer exposures and a Hydrogen-alpha filter will show the nebulosity extending out to the left and curling up like a huge comma. This was a really fun target, and I’m looking forward to Jane’s discussion of it. Finally I wanted to see if my little 4-inch refractor could possibly do justice to one of the most popular astrophotography targets. Here in my naked-eye resolution piggyback photo is the Orion constellation, with its famous bright star-birth nebula near the dead center of the photo. The target I had in mind wasn’t the Orion nebula itself, but two very different nebulae near the left-most belt star Alnitak (Zeta Orionis). Just to the left of Alnitak is a bright yellowish nebula called the Flame. In a telescope it shows a lot of detail, looking almost like tire tracks. 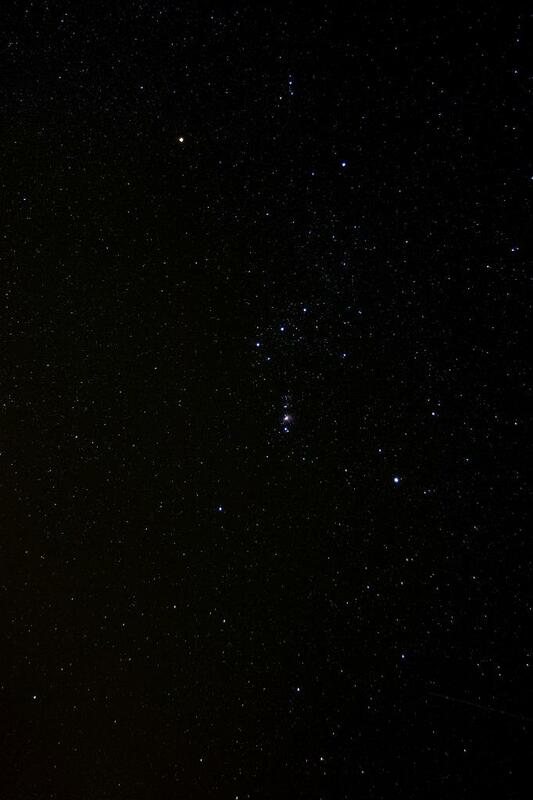 The full-resolution picture of the constellation has just a hint of the flame. If you already know it’s there, you might be able to see it. For my piggyback photos I used my Canon 20D digital SLR camera, mounted on top of the AP Traveler. I shot 5-minute exposures, and tried to subtract a 5-minute dark frame, which doesn’t seem to make much difference. The camera does leave behind a reddish glow which I’ve removed in Photoshop. 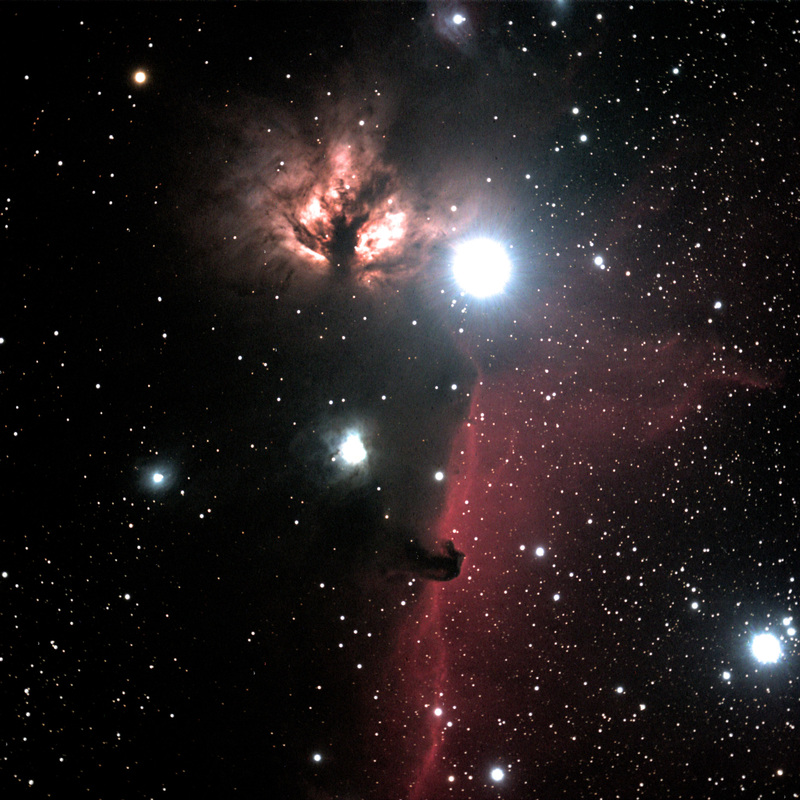 Just below Alnitak is the Horsehead nebula, also known as Barnard 33. Seeing the Horsehead visually is a fun and difficult project, requiring really good transparency and a fairly large telescope. Jane observed it visually in her 12.5-inch. I never dreamed the image would turn out this nicely. The big white bright blob just above center is Alnitak. In the lower right is Sigma Orionis, one of my favorite multiple star systems. Of course the bright Flame is just left of Alnitak, and dark nebula B33 is just below center. Just as with M33, this image is made up of four 15-minute exposures. The telescope is a 105mm f/6 Astro-Physics Traveler, with an SBIG ST-4000XCM one-shot color CCD camera. The mount is the AP Mach-1 GTO on wooden tripod, and I did autoguiding and image capture with Software Bisque’s CCDSoft. I used SBIG’s CCDOps software to process the Bayer-matrix one-shot color pixels out to luminence and RGB components, combined the L and RGB components in Photoshop, then stacked the four color images for the final photo. Maybe you can give me some tips one of these days. See you tonight in Monrovia. Wonderful just simply wonderful pictures.